Under the direction of two doctors, a capable contingent made up of numerous specialists and engineers with rich practical experience has been in the wake of the international latest technology development, combining abundant nonferrous metal resource, in accordance with the quality standard of international well-known kinds and the best technical specifications creating and developing a complete set of brand new production process and products. The company's investment projects spread in jiangxi,liaoning, shanxi, zhejiang provinces etc. The company mainly engaged in production and trade of titanium and aluminium molten auxiliary material (titanium boron refiner,titanium tablet additve,alumina ceramic foamfilter, etc), titanium sponge, ferro titanium,ferro vanadium, titanium profile (plate, tube, etc),magnesium chloride anhydrous (block) etc. The products have been sold widely at home, some of them have been exported to korea, japan, germany,spain,vietnam and other countries, now it has more than 300 various clients throughout the world. The annual export turnover reaches us $20, 000, 000. 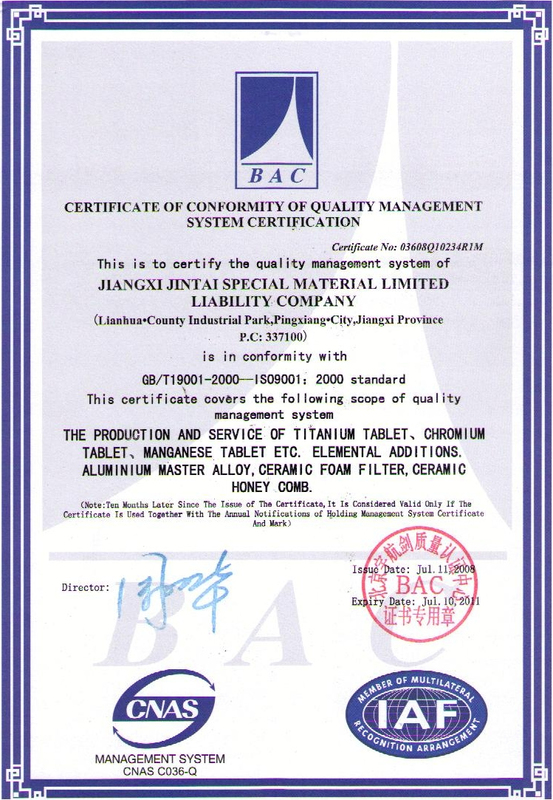 The company is equipped with advanced domestic production equipment and analysis and test instruments and has passed through ISO9001: 2000 international qualitys ystem certification. "Blazing a new trail, pursuing perfection and adhering to standard" is an embodiment of constant progress of Jintai products; "Integrity oriented and service paramount" is the operation conception of Jintai group. Jintai people has been striving continuously to make new progress, taking serving customers as its own mission and customers' satisfaction as its objective; Jintai group has been dedicating to creating the first class ferrous supplier in the world. Jintai people are looking forward to your joining with "golden credit standing and Taishan-like promises".